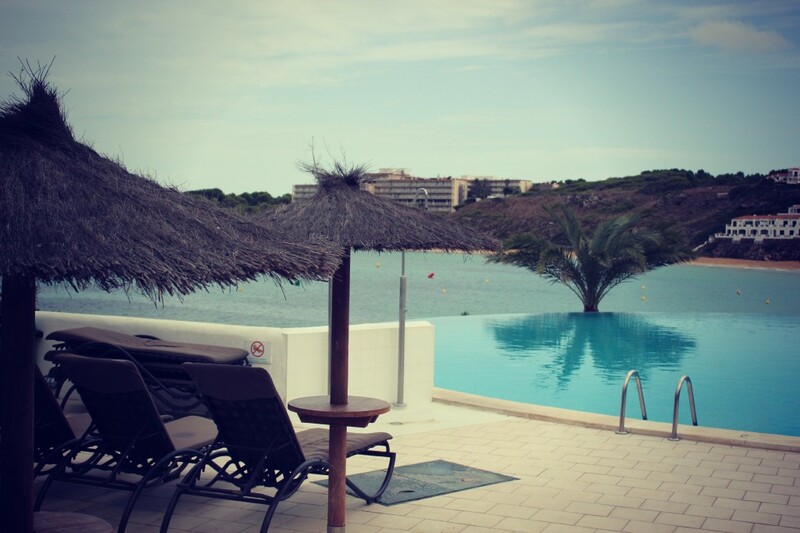 So Jared and I arrived in Menorca (an island off the coast of Spain) on Wednesday and have had a lovely and relaxing time so far (which you will hear all about in due time). However, there is something so imperative at this time, that all of the nitty gritty detail about our trip must wait. This is important. 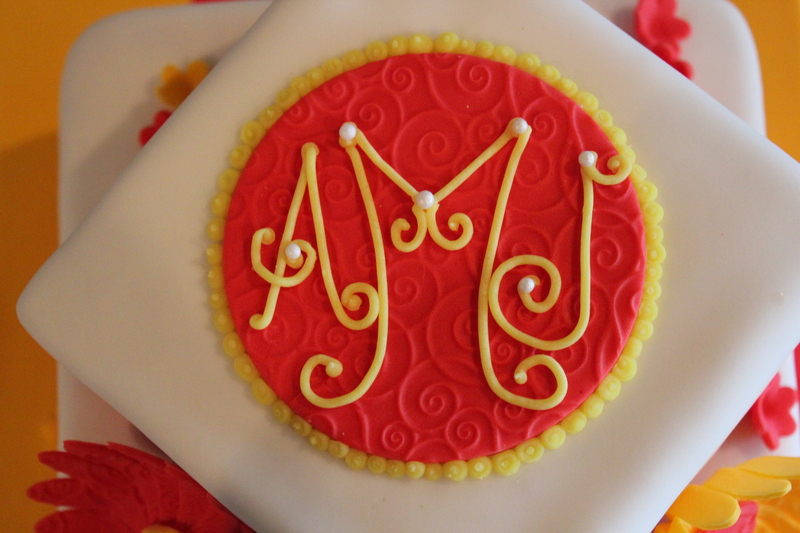 I asked Jared this afternoon if he wanted a special treat for his birthday…like apple pie, I suggested. He jumped on that band wagon and we ventured off to purchase apple pie supplies. We walked across the island cove and realized something bitter. All of the supermarkets on the island might as well be considered convenient stores, gas station convenient stores at that. 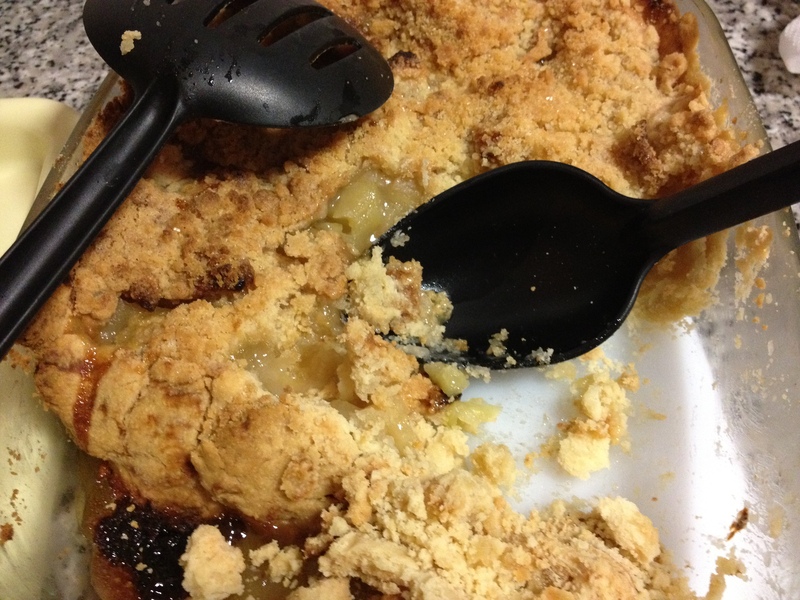 So we dealt with what we found and had the most entertaining evening of our apple-pie making lives. Something SO entertaining, that I can’t even words to describe …you just have to read the recipe. Go to the nearest gas station type grocery store to buy your supplies. Understand that the prices will be jacked up, and there is nothing that you can do about it. You will NOT find cinnamon or brown sugar there, or at least we didn’t and had to deal with it. To make the crust, combine flour (understand that flour in Spanish is harina), eye-ball the sticks of butter, because everything is in the metric system, throw in the salt, sugar, and combine. Forget about the ice water…we did…and wondered why it was so dry. Trust me…it doesn’t matter. Don’t bother with a pie plate, they are so over-rated, and timeshares apparently don’t think there are in style anymore. Rather, opt for an olive oiled glass square style casserole dish, much more practical. 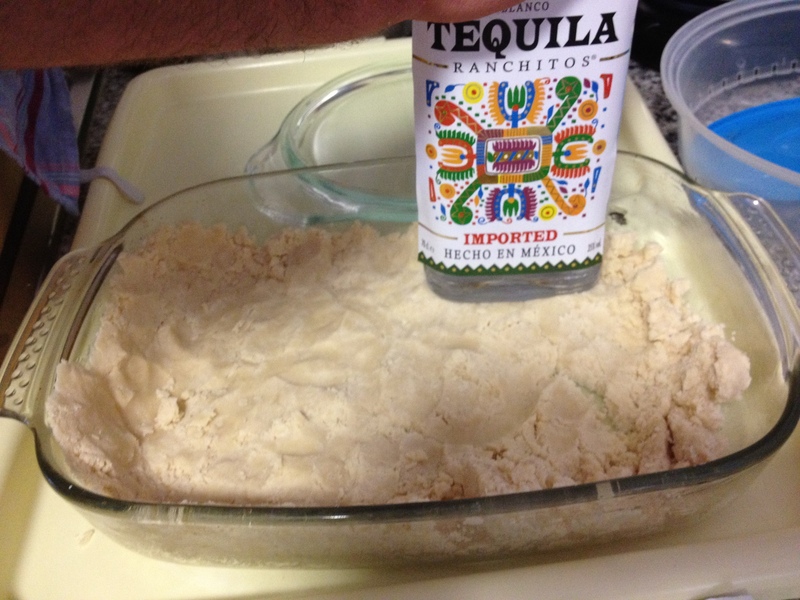 Or, as shown below, see if the tequila bottle has more flattened bottom. 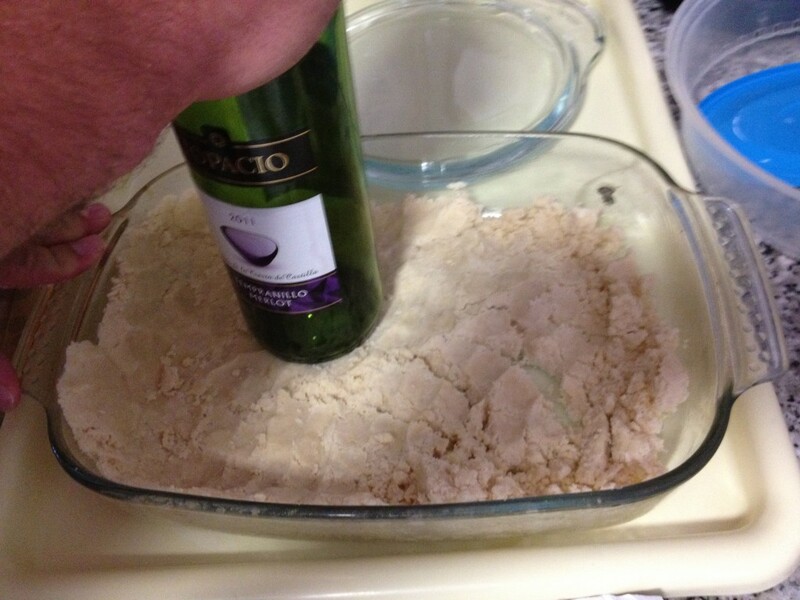 Use these, or other similar tools, to press the pie crust inside and around the edges of the dish. The crust may be uneven, but who really cares these days. It’s pie crust for everyone. Some may like it dark, some may like it golden brown, and some may like it undercooked. You, my friend, are a people pleaser. 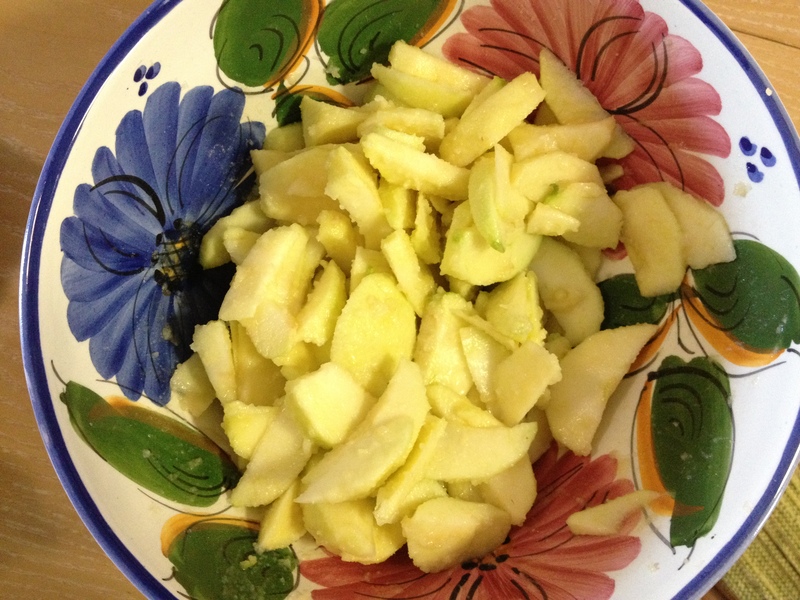 Next, set that crust aside, and prepare the apples. I decided to use golden delicious, not because I think they are a better apple, but because the gas station didn’t have any other kind. Sometimes, you have to make sacrifices. Combine the topping ingredients without a mixer and without a pastry blender. 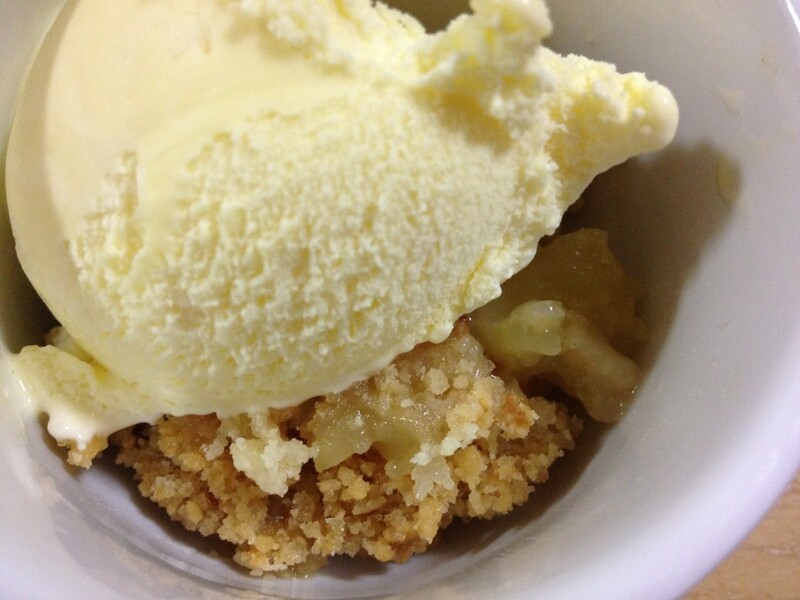 Use those hands that God gave you (or a knife) to “cut” the crumble until it resembles small crumbs. 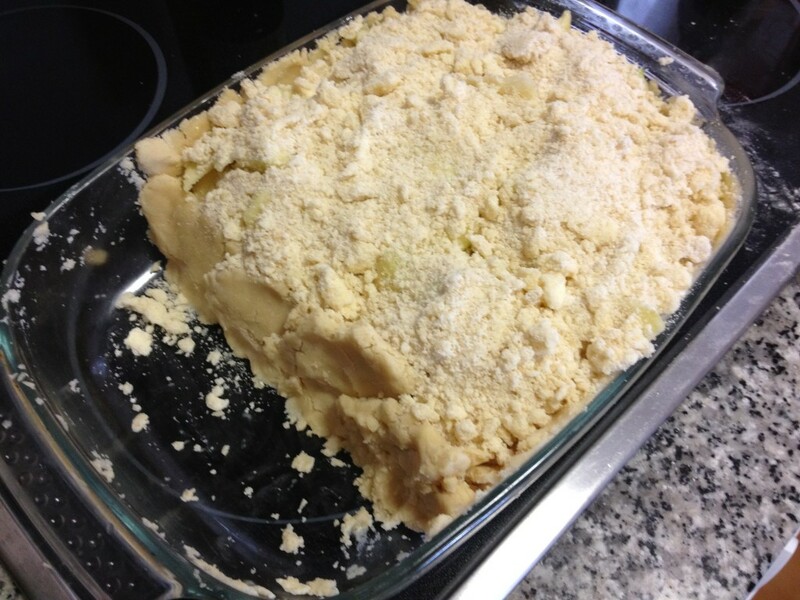 Take the crust and add the apple mixture on top. 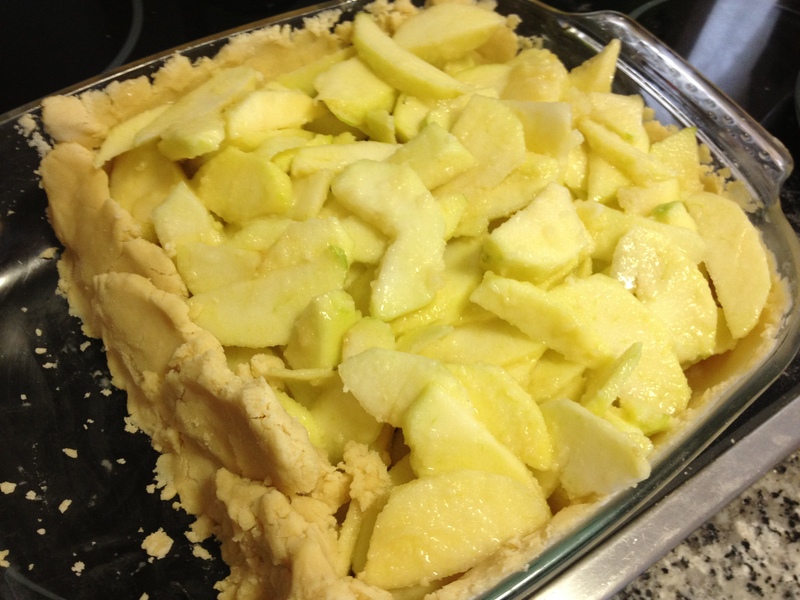 You will realize at this moment that your supply of apple mixture is strangely proportional to your crust. 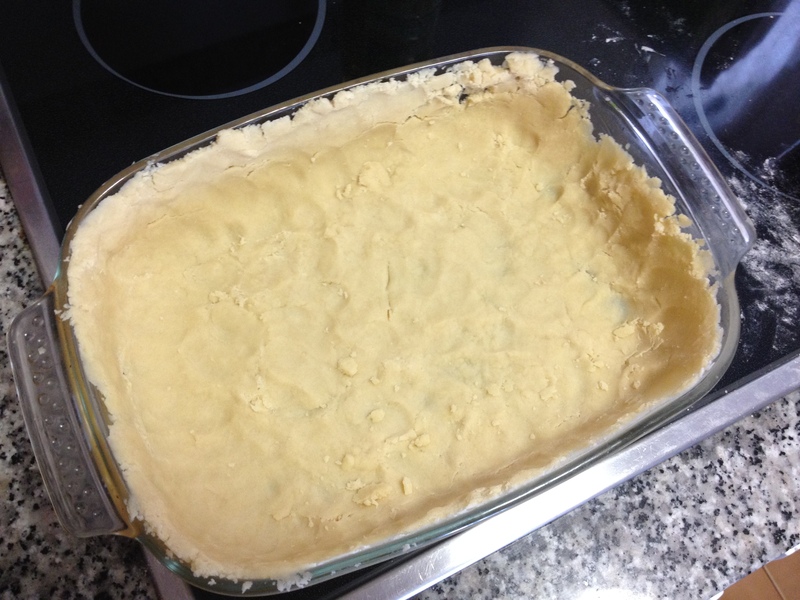 Quickly, remove some of the crust from one side, and form a “pastry blockade” (as shown in the picture). Bake for 45 minutes. Next, take the temperature down to 350* bake for another 30-35 minutes until you can insert a knife and the apples appear to be tender. If the apples aren’t tender, and you can’t seem to wait…I would take it out. You have already screwed up everything else, what’s the worst that can happen? Best served with gas station vanilla ice cream. He just shook his head in utter shock of what he beheld. Seriously, I don’t even get it. 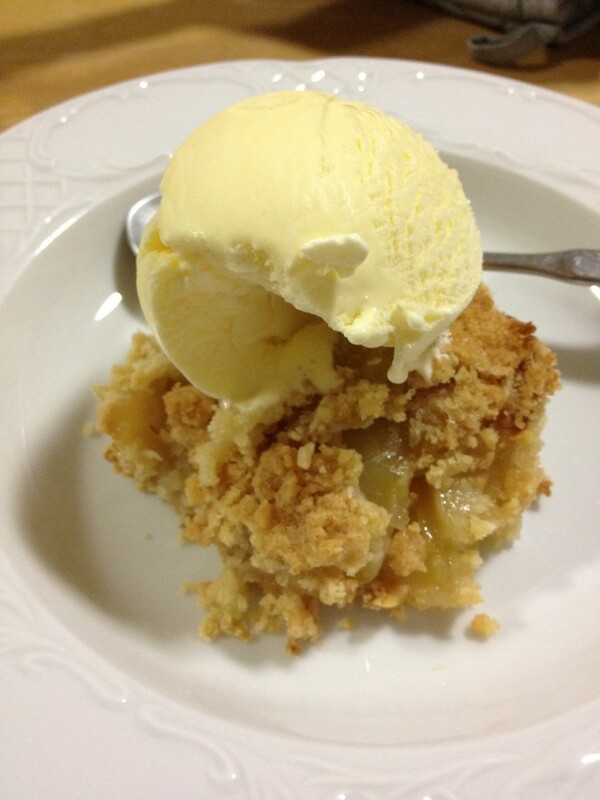 The tenderness and delicate flavor of the golden delicious apples were a perfect balance to the lack of cinnamon. It showcased the simple flavor of the buttery golden crust with a highlight of the random honey drizzle that I threw in there. 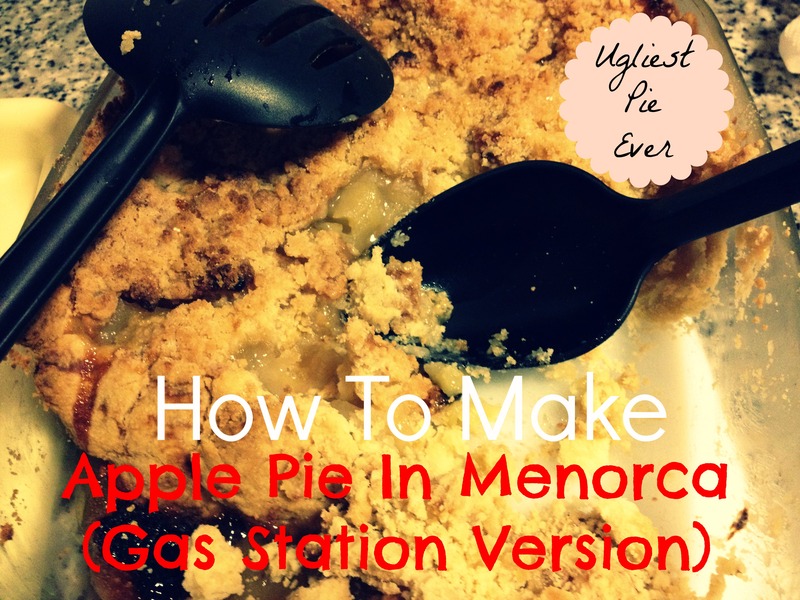 Gas station apple pies are the best. I think I’m going for my 3rd slice in about 5 minutes. And while I’m here, I might as well give you a taste of what kind of view we are enjoying from this fabulous Menorcan resort. Yes, I know…we are living such a rough rough life right now.